Mac OS X Leopard: applications that come with Leopard as well as a couple of the developer tools. This is the second in a 3-part overview of Apple’s new operating system, with the final part to be published tomorrow. In this part, he looks at the applications that come with Leopard as well as a couple of the developer tools. I love Mail. Everything about Mail is so awesome. There’s nothing special about the mail features but it’s what has been added to Mail that makes it a special app. RSS has been moved from Safari to Mail. This is a much better idea than using Safari. I used to use Vienna but I’ve always wanted this in Mail. My wish has been granted. It works very much like e-mail but with web feeds instead. 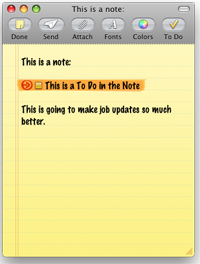 Notes is a handy feature to have and you can even have To Do’s within the Note. To Do’s don’t have to be in Notes though, they can also be on their own. One of the best things I’ve seen is datatypes. Having Mail automatically select addresses, phone numbers, and appointments is such an amazing feature that will save so much time and effort to remain organised. With datatypes, for example addresses, it selects the address automatically from the body of the e-mail (placing a dotted box around the entire address), allowing you to then easily add it to the Address Book from a drop down box. This is the same for phone numbers whereas dates will be set as appointments in iCal. Dates are also interpreted, so Leopard will realise what "Next Tuesday at 8pm" means and will add the date to iCal as an appointment for the next Tuesday in your calendar. Mail is quickly becoming a powerful tool for organising information and I can see it becoming something far grander in the next OS release whenever that may be. Stationary is one of those fun but completely unnecessary things although I have to admit that there are some benefits to them. Business users could make their own email templates which can give them a more professional look. The downside is that not everyone can read them in their intended form when they receive them in their email software, so all that effort may not be used to good effect. 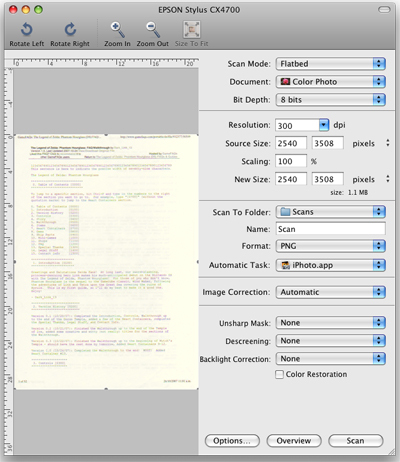 What would be nice would be an inspector within the application that helps you to format images and objects better. The activity window is now in the same position as album art in iTunes which is a nice touch. 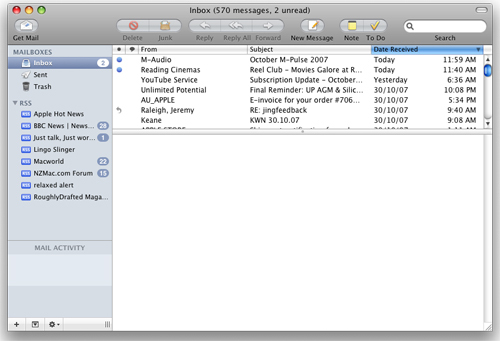 I’m very much leaning towards listing Mail as the Killer application on Leopard, more so than Time Machine. I still would prefer to see iCal rolled into Mail though. AppleTV’s interface is now on the desktop. This is such a nicer interface than the old one and seems more responsive as well. I love the movie trailers section. although it wasn’t a feature I had used previously. 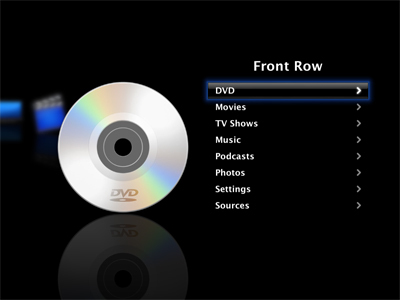 One thing I really like about this version of Front Row is the fact that it doesn’t have a movie preview playing within the menu. This made the previous version sluggish and made selecting movies a pain. Instead you get a thumbnail which then reduces in size, with some details of the movie showing up next to it. This is much nicer and a lot less intensive. As such Front Row feels extremely responsive. But of cooler note is that Front Row will play DVD files on your hard drive. Nice if you ripped a DVD using say Mac The Ripper and you want to ensure it worked or to test out a DVD that you have created yourself before you cut it to disc. 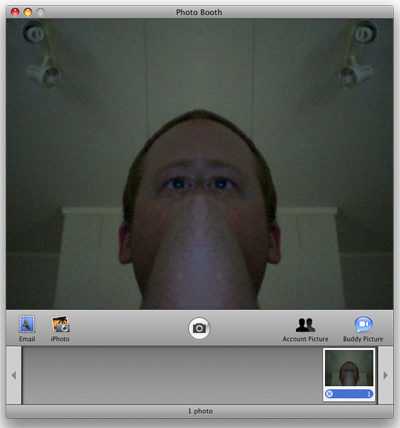 Photo Booth was an app that only came out on iSight enabled Macs under Tiger but it is now part of Leopard. It’s kind of neat but is pretty much a useless app for anything other than taking pictures for iChat images. Oh sure there are some interesting applications for example stop go animation frames but in reality it’s not really that useful of an app. Most of what you can do you can either do in iChat or iMovie so Photo Booth seems to be a bit of a waste of space. Photo Booth can do both photos and videos but video is limited to video only, no sound at all. I think the video aspect is so that you can make background video for your iChats which is a little dumb. That being said though you can have a great deal of fun. You can have different backgrounds like clouds and so forth, or your own creations. I’ve got a video on YouTube that shows you some of the stupid things you can do with Photo Booth. Here I have actually created a layered video by recording the background video first, then using that as a background, and then recording that to use as a background. In essence creating a 3 layer video using only two. That in itself is pretty sweet. Preview has a nice clean metal look and it feels so much better to use. I was under the impression that you could edit PDF documents but I seem to have misinterpreted comments related to the application. It is useful for adding blank pages and other things that seem somewhat dumb. Essentially the viewer is the same old Preview but with a more system wide look to it. You can fill in PDF forms using Preview and do extremely basic picture editing (think of iPhoto 1) but it’s killer feature is viewing things and as such it is perfect. The very first thing you’ll note is a feature many people have been screaming out for… the Dock icon reflects that actual date. This isn’t just when the app is loaded, no this is all the time. There’s very little differences on the face of it to any other version of iCal but there are some behind the scenes features that are notable – for example accessing the new CalDAV servers found in Leopard server. This is a server based calendar system kind of like Outlook only standards based. It allows your calendars to be shared. This is very useful in a business because it allows you to see if someone is free or not and book you accordingly. The To Do list is shared between Mail as well and there is a calendar that shows appointments created in Mail. 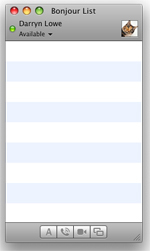 Unfortunately you can’t create a calendar in iCal in the Mail calendar which is a bit of a pain. 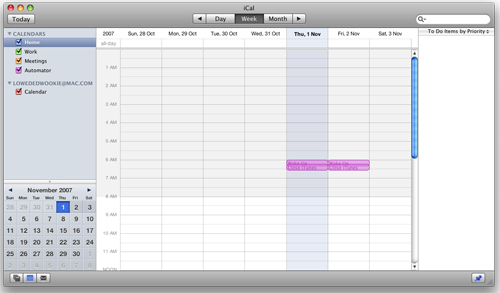 Like I said in Mail, I’m still desiring for iCal to be merged with Mail to make this a one stop shop for organisation. It’s still a great app though. iChat just keeps getting more powerful. Not only does it support conferencing but now it supports presentations over those conferences. This is a great tool for any business because you may have a couple of sites that need to sit in on a presentation but it might be logistically a nightmare to do this at the same time, thus leading to a road show which can be costly. Not any more it isn’t. With iChat you can run videos, Keynote presentations, even Numbers spreadsheets. But there is a dark horse lurking in iChat – you can remote control your recipient’s machine. This feature alone makes iChat one of the most powerful inclusions in Leopard. It means that you can show someone how to fix a problem instead of trying to tell them how to fix the problem. This is done via voice and video chat. I played with this feature with my workmate’s MacBook Pro and it works so nicely. Everything is more or less in real time but I expect that over the Internet it will be somewhat slower. That being said though we were working over wireless at 802.11g speeds due to the limitations of my Mac Mini’s wireless (so want N). We tested playing a video file (Heroes Series 2 Episode 6 – don’t ask) which I uploaded to his machine via iChat. It took about 10 minutes to transport the 400Mb file which wasn’t too bad considering the network is only G specced. Despite this the video played well and even at full screen including sound. I’m pretty sure that Remote Desktop on Windows won’t allow video. Switching between screens is done via a box sitting on the bottom right of your screen which is also where video of the other person sits. Of course iChat also has the standard video/voice/chat features of previous versions. Version 3 has been around in beta form for a good while now. Finally we have a full release version and it is nice. There’s no real difference at first view except for a new icon of a dotted-line box with a pair of scissors. This is the new WebClip feature which allows you to quickly make a selection of an area of the page that updates regularly. Click the icon, hover over the Recent Topics section and you will see that it automatically selects the entire section, except for the title. The interesting thing is that you don’t actually need to select the title as WebClip will actually add that anyway. Safari is fast. I mean it was fast in version 2, it was fast in version 3 beta, but it is faster than those two put together in Leopard release. Admittedly speed in relation to a browser is very much dependant on bandwidth speed but it screams like a cut cat on my Intel Mac Mini with 2Gb RAM. It handles Google Docs with ease and games on Miniclip work fine, although Adobe continue to drag the chain on releasing a Universal Binary version of ShockWave so some games can’t be played. So far I haven’t come across any sites that don’t play nicely with Safari although there will be some that is pretty much a gimme thanks to lazy website developers. It’s kind of hard to say what really has changed with Safari because I’ve been using the beta so long that the only thing I can see being ‘in your face’ different is WebClips. That’s not a bad thing, it just makes reviewing it a bit more difficult. To think of TextEdit as a simple text editor belies the true power of this app. In fact this little fella does things that not even Pages can do. For example, Pages can read Word 2007 files but it cannot write to them. Guess who can? 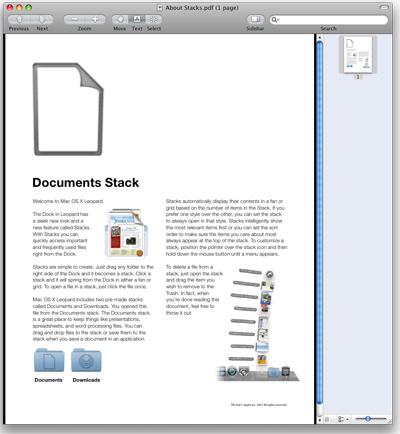 But TextEdit has another trick up its sleeve because it can even handle the ODT (OpenOffice Text) file format. That means it officially supports more formats than it’s professional counterpart. Not bad for a "simple text editor". One thing I find is still missing from it though is line numbering. This I think makes TextEdit fall into a weird position. It’s too simple to be a full on word processor but it’s not feature rich enough to be used for programming or web editing (code). Line numbers would solve this and move it to something more useful. For making simple notes Mail is a better app for that but that’s not to say it doesn’t have its uses. TextEdit is perfect for writing novels, although the lack of a word counter can be limiting here but I don’t think that matters too much. Of course, like previous versions, TextEdit still writes in plain text if needed. It’s a tool I use quite often quite frankly. Directory is an interesting app that is really only of benefit to networked machines. Basically it’s a global address list but it can be used for directory listings in your business etc. It’s basically a client for LDAP servers which means that any changes on the server gets changed on the client machines. On the surface of it does seem somewhat limited in appeal when you consider that Address Book can handle LDAP servers anyway, however it’s a little more complex in abilities than just a directory listing. Not only does it show you the person, their numbers, their photos etc like Address Book, but it can show you their department and who their managers and department heads are. This can be handy if they brass you off I suppose, because you can then see who their manager is and give them a good bollocking. This app really is aimed at businesses large and small that have networks. For most, Address Book is the more usable app. This one threw me for a six. I’ve never had a problem with Boot Camp before and this is no exception except for when going to install Windows. The DOS side of the WinXP install wouldn’t work and I was freaking out because I couldn’t install Windows and I couldn’t reboot into Mac OS X because the Option key wouldn’t work. In the end I inserted a USB HP keyboard I had floating around and this worked perfectly. I could install Windows and thus reboot. 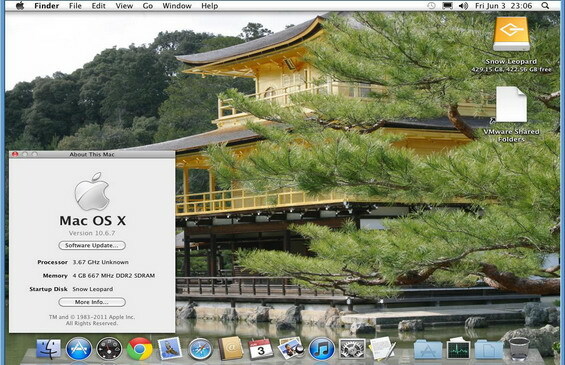 Once XP was installed I was able to the Apple keyboard fine. I’m not sure what happened but it’s all go now. Note: Anyone with the new Apple Aluminium Keyboard note that the Option key doesn’t work as expected for some reason. There is a rather interesting workaround though. When the machine reboots hold down the Menu key on your Apple Remote and that acts like the Option key. You will need to use FFWD and RWND buttons for left and right and Play as the Return key. Odd I know but it really works. The main difference with Boot Camp is that the drivers are now on the Leopard install disc. 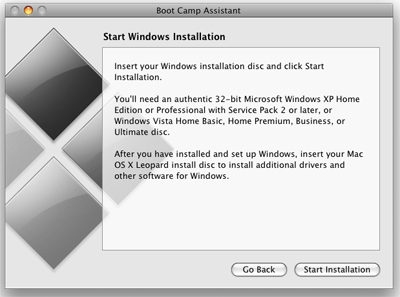 Once Windows is installed simply insert the Leopard DVD and the Boot Camp software will be installed. Of note is that all the drivers are certified by Microsoft which I thought was quite funny. iTunes is the same iTunes we’ve been using for a couple of months so nothing’s changed here. That being said though there are three new visualisers with my favourite one being Stix (shown). 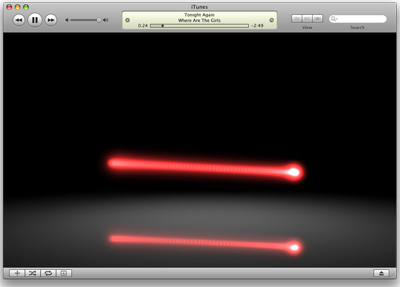 iTunes plays as well as expected and like the iLife apps below just can’t be faulted. Aside from the visualisers there doesn’t appear to be anything obviously new. Image Capture sports a new system wide look and gains a couple of new features. One is a document type which is listed as Text but this seems somewhat moot on account of none of the Formats allow for text editing, except maybe PDF. What would be nice would be an option for scanning and saving as a Pages document although traditionally OCR software is somewhat a joke. I do like Image Capture though and use it a lot for scanning in things like drawings my nephews have done for me, cells for animations, and other like things. Considering that like the printer, I had to install no scanner software as the drivers were already installed, Image Capture is the nicest software I’ve used for scanning. I think Image Capture is a must for anyone doing a lot of scanning. I have mine set up to save to a directory then upload to iPhoto which makes organising so simple. One thing that still irritates me about Image Capture though is that you still have to manually select the border around the image that you want to scan. This is contrary to other scanning apps that automatically select the border of the image, although to varying degrees of success. It’s not a major issue though because this way you have more control over what’s selected but it would still be nice to have it select everything then let you move the borders around to suit. XCode – As always Apple gives away their development environment so as to allow programmers an easy way to develop apps for Mac OS X. The XCode editor hasn’t changed overly in appearance but Apple has included some interesting project environments including Ruby on Rails for developing web applications. One thing that Apple has stated is that any app created using XCode should work on any future release of Mac OS X so considering the developments tools are provided free of charge and Apple has developed some high class frameworks it seems dumb to reinvent the wheel and make your own (are you listening Adobe and Microsoft?). Dashcode – An interesting new development tool is the much talked about Dashcode. Dashcode is to widgets what XCode is to applications. 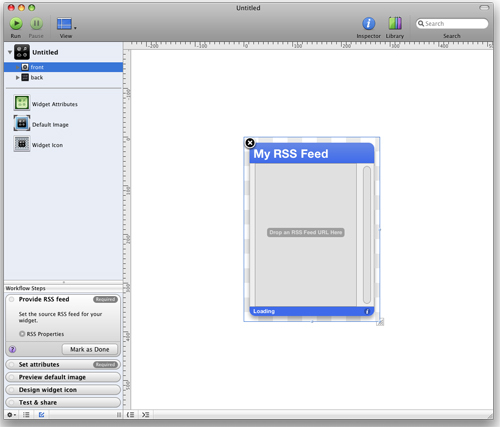 It has some templates that allow you to setup anything from Feed Readers to podcast grabbers, to even games. I have had a play around but need to find some good tutorials because it can be a bit odd at times to get your head around. With a couple of tutorials under my belt however I feel it will be something that will be very useful to use. Instruments is a wrapper for some command line apps developed by Sun Microsystems. These tools allow you to see what your apps are doing, what your system is doing and thus, is an extremely powerful tool for troubleshooting your apps. I’m not a developer so much of this stuff is over my head but from what I’ve heard from a lot of developers this is a welcome inclusion to the XCode environment. Once again WebObjects has been included as part of the developer package. For those who don’t know what WebObjects is capable of, chances are you’re already finding out what it can do if you go to Apple Store or iTunes Store. WebObjects is a very powerful web application development environment that allows you to do amazing things very easily. What’s really amazing is how much Apple wants to push this technology. WebObjects was first introduced in Tiger as part of the development environment but before that cost at least $2000. We’re talking $2000 of environment included with the latest releases of the Mac OS X operating system. There is of course more to the development environment than just the main apps. The development environment now supports Objective-C 2.0. Interface Builder allows you to create interfaces with things like CoreAnimation and other APIs. Of course all the development tools allow things like Fink and MacPorts to be installed and thus access to a lot of UNIX based apps as well.